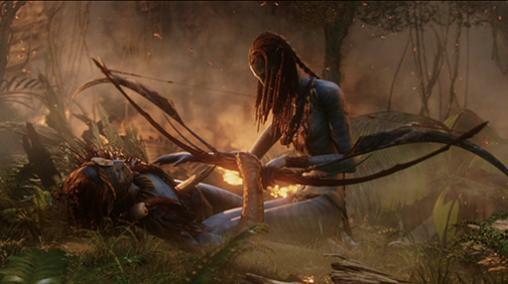 Ceremonial Bow (Eytukan's Bow) | Pandorapedia: The Official Guide to Pandora | Own AVATAR on Blu-ray & DVD Now! A young leader, usually the Olo’eycton-in-waiting must prove himself with this bow, in hunt or war, in order to wield it later as a symbol of power. Function Ceremonial, but can be used for hunting. Size and Weight 2.9 meters long, 3.7 kilograms. Materials and Construction Shaped wood, string is made of animal gut. Notes This ranged bow is primarily designed for ceremony by clan elders, but it is crafted to the peak of Na'vi design and thus functions perfectly in hunt or battle. This bow is fashioned in honor of the direhorse, with a direhorse queue fashioned to the interior of the bow. These exquisite bows are usually handed down from generation to generation and become powerful symbols of survival, continuity and tradition.